The surname is derived from the Gaelic word for a Norseman, but according to tradition Clan MacLachlan is descended from Niall Noigiallach, Niall of the Nine Hostages, High King of Ireland, through Ferchar of Abrothan, Prince of Aileach. Recent research has thrown doubt on the Irish origin, postulating a wider Gaelic Society that in Argyll was isolated from the Pictish culture to the East because of difficult communication routes. Whatever the origins there is documentary evidence that Lachlan Mor was established on the shores of Loch Fyne by the 13th century. 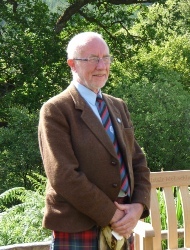 By 1292, having acquired lands in Cowal through marriage, Archibald MacLachlan was one of the Barons whose lands were formed into the Sheriffdom of Argyll. Ewen MacLachlan rendered homage to Edward I of England in 1296, but Gillespie MacLachlan attended Robert the Bruce's first Parliament in 1309. 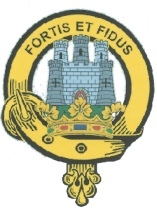 The Clan MacLachlan Society was founded in 1979 and now has over 1200 members world-wide, spread over a number of branches. The parent society produces a bi-annual magazine, ‘Clan Lachlan’,which publishes a variety of articles of interest to Clan members .The branches all produce their own local newsletters and organise events and gatherings. MacLachlans of all spellings are welcome to join the Society, as are members of Clans Gilchrist and MacEwen. This is the Clan Crest within a buckled belt. 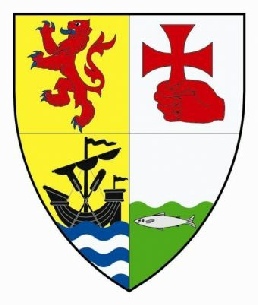 The arms of the chief of MacLachlan show the families to which they are related or are thought to be related.